The recent success of movies based on superhero comics has inspired some smart conversation about how the political and social themes buried in the comics should evolve as the franchises are translated in different mediums. It’s a conversation that reminds me of the potential of these stories to explore meaningful issues in other media and the limits of superhero comics published by Marvel and DC. I’ll admit, when I first read this, I mistakenly assumed that she was referring to the comics, not the series of films. When it comes to the films, I think she’s mostly right. Bryan Singer and Matthew Vaughn were explicitly aiming for more than just the typical action franchise with the X-films, and came surprisingly close to sustaining a metaphor for the gay experience. Chris Nolan’s Batman movies were a meditation on the post 9/11 security state and Bryan Singer’s flawed but interesting Superman Returns explored notions of manhood and fatherhood. In contrast, violence and melodramatic soap opera are so firmly embedded at the core of Marvel and DC superhero comics that it’s much harder to argue that the “toys” aren’t the point. The allusions to identity, community and minorities are effective when used as accents to help the reader fill in the gaps of the fictional world. In superhero books, a writer who borrows the language, imagery and/or motifs that the reader associates with real world is like an artist who uses photo reference to transform generic locations into places that feel real. Think of how Grant Morrison evoked the intergenerational tensions in the civil rights movement in the late 1960’s and the American rock scene in the 1970’s in his run on New X-Men to encourage the reader to imagine a fully realized mutant culture that had never really been fleshed out in the comic books. The trouble is that whenever a writer of a Marvel or DC superhero comic transforms an allegory for a general idea into one for a specific movement or community, they remind the reader of the weaknesses in the narrative and run the risk of (inadvertently) offending the audience. The paralells to real world events and social movements are frequently amusing but have their limits. Darkseid is a great metaphor and symbol for oppression informed by the Second World War and the Holocaust, but if the writer gets too close to the reality of either event, everything turns horrifyingly perverse (and you’re reminded that there aren’t many stories told about the Hunger Dogs). It’s even tougher for the X-books, where any explorations of the “mutants as oppressed minority” idea are complicated by the absence of a coherent mutant culture. 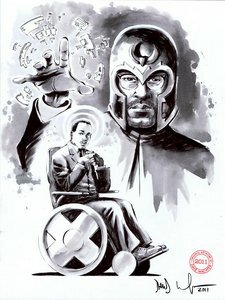 It’s fun to think of Professor X and Magneto as Marvel’s Martin Luther King and Malcolm X, until you think about all of the things both men stood for and accomplished. There’s something deeply silly about drawing an analogy between one of America’s great men and a founder of a paramilitary academy for young people or a terrorist and a complicated, brilliant political activist and leader. This was also the main reason why Rick Remender’s now infamous decision to have Havok (the mutant leader of an Avengers team and brother of Cyclops) declare that he wanted to be identified as Alex instead of a mutant was so problematic. The scene is intended to evoke the conflict between assimilation and retaining cultural identity within the African American and gay community. Any emotional punch that this moment could have had disappears once one realizes that the character’s statement wasn’t unrealistic or controversial, but completely logical. Unlike every identifiable minority in the real world, the only thing that Marvel’s mutants have in common are the existence of powers and oppression. There is no shared history or traditions, no sense of community. The panel didn’t remind me of people rejecting their sexual or ethnic identity, because there wasnt really anything for Alex to reject. 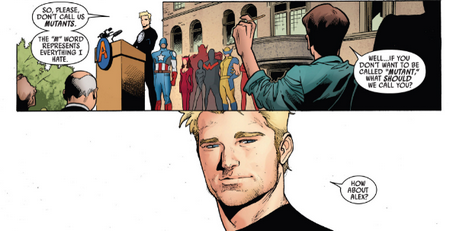 The reminder of a real world conflict (whether in the form of the age-old debates around assimilation in the black community or the closet/end of gay culture debate in the LGBTQ community) only reminded the reader of the narrative seams in the Marvel Universe. This is not necessary. The powers that be at Marvel can always decide to embrace the implications of a world with mutants and give its writers the freedom to invent and explore a mutant culture. This will never happen. Marvel has maintained a commitment to ensuring that its fictional universe bore some resemblance to the world outside our door since the early 1960’s, and a fully realized mutant culture might undermine that. I also wonder if the use of shorthand that helps creators tell effective superhero stories is the opposite of what’s needed to explore serious ideas about identity, religion or ethics. Maybe we shouldn’t expect these stories to do something that they just weren’t designed to do. At least we have the films, right? Well, maybe. Although filmmakers have used the film franchises based on Marvel and DC comics as a vehicle to occasionally explore meaningful issues, there’s a real risk that the success of the films will make studios more cautious about allowing them to create a world rich enough to sustain a meaningful allegory. I imagine that this will be a more significant issue if Marvel’s efforts to treat the talent who direct and perform in its films like the talent who write and draw its books is successful. If DC, Fox and Sony replicate this model, many of the elements that make these films more than bland consumer products may be lost.